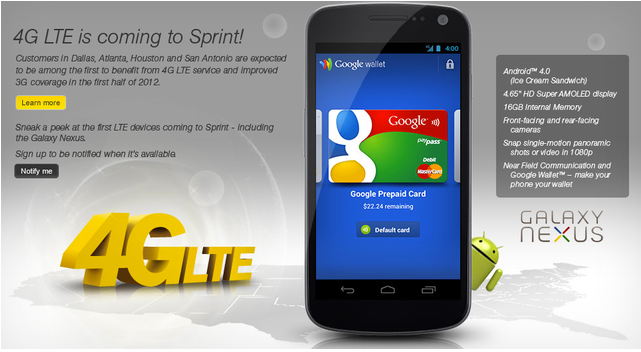 In the last week, we have seen the leaked ad banner which suggests the arrival of the LTE Galaxy Nexus to the Sprint with all NFC capabilities and complete support with the Google Wallet officially, but now the Sprint finally comes up with official announcement of the device, and showed up the device arrival at their stores with complete functions. Unlike Verizon’s Galaxy Nexus offer, Sprint has openly highlighted the Google Wallet and the Galaxy Nexus NFC capabilities, and trying to get the benefit from the Verizon non-Google Wallet support on Galaxy Nexus. Galaxy Nexus is said to be one of the best Android phone that Google and Samsung has launched yet, and the phone has already started appearing in the hands of users at the wide range. It was recently rumored that Sprint will get the processor speed bumped Galaxy Nexus version with less storage memory than the Verizon, but until now, there are no words from both vendors on the specs of the device, as well as no availability date announced by Sprint. According to the side report, we can claim that Galaxy Nexus will launch on the Sprint, when the carrier finally upgrade itself to the latest 4G LTE technology in late this year.